Visual form and the handling of materials in this freestanding house are inspired by traditional Dutch farmhouse construction but its contemporary composition of reed, timber and brick is very much out of left field. 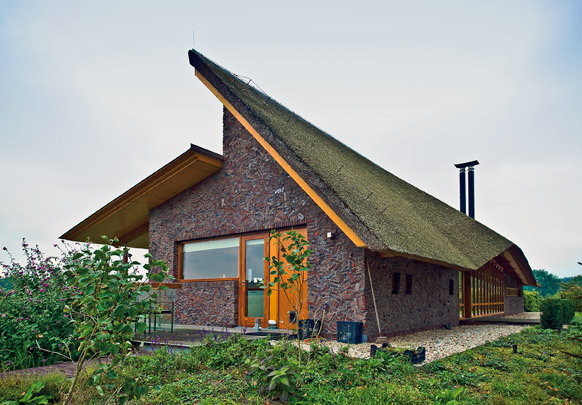 The reed lean-to roof has an uncustomary slope of 45 degrees and ripples upwards at the entrance; an aluminium-clad roof does duty at the front. There is all-glass balustrading round the timber structure of the veranda and sintered brickwork of wild bond. The southeast facade contains more than its fair share of glass. The house stands on a 'terp' or artificial mound and has a basement of bedrooms. Its ground floor contains the living room, dining room and kitchen and sports a wooden veranda and two terraces.